The Seahawks avoided an episode of high dubiousness when Mike Davis produced a 33-yard run Sunday against the Arizona Cardinals at the Clink. Without that gambol, Davis would have concluded Seattle’s 9-7 campaign with 207 yards, one fewer than the injured Chris Carson way back in September. For the Seahawks, the face-saving part is that Carson could have become the first NFL running back to lead a team in rushing for an entire season after participating in only four games. Carson joined the Seahawks as a 2017 seventh-round draft pick out of Oklahoma State and received the bulk of the carries (49) in Seattle’s first four games, against Green Bay (39 yards), San Francisco (93), Tennessee (34) and Indianapolis (42). In the fourth quarter of the Seahawks’ 46-18 win over the Colts, Carson suffered a severe high-ankle sprain when his left leg was pinned in a pile. That led to surgery and Carson didn’t make it back this season. With RBs Eddie Lacy and Thomas Rawls unable to get anything done, with C.J. Prosise injured and J.D. McKissic mostly confined to passing downs, the burden of Seattle’s running game fell to QB Russell Wilson, who accumulated most of his team-leading 586 yards on improvisational scrambles after Carson’s exit. McKissic became the only Seattle running back to score a touchdown, tallying from 30 yards against the Colts shortly before Carson went down. That was that as far as TDs by running backs were concerned. The Seahawks became the only team since 1978, when the NFL adopted the 16-game schedule, to get just one rushing TD from their running backs. Turns out Seattle is also the only team in the era of 16 games to get less than than 300 rushing yards from its lead running back. As noted, Davis led with 240. How lame is that? The second-lowest, team-leading total by an NFL back in the past 40 years is 311 yards. The Cleveland Browns went 0-16 this season. Their leading rusher, Isaiah Crowell, ran for 853 yards (and two TDs). The NFL’s only other 0-16 team, the 2008 Detroit Lions, nearly had a 1,000-yard rusher, RB Kevin Smith amassing 976 yards and eight TDs in only 12 starts. The worst team in Seahawks history by record, the 1992 Tom Flores bunch that went 2-14, managed a 1,000-yard rusher in Chris Warren (1,017 yards) despite scoring 140 points, fewest by any team in the history of the 16-game schedule. One more way to look at Davis’s 240: The Seahawks have rushed for 240 or more yards in a game 16 times in their history, including a 350-yard performance against the New York Giants Nov. 9, 2014. 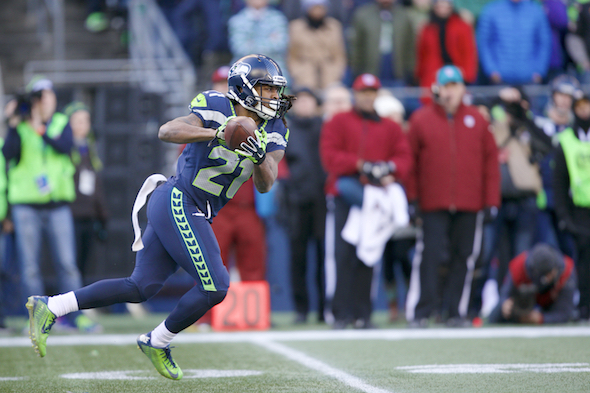 Wilson’s 29-yarder to WR Doug Baldwin was his 19th fourth-quarter touchdown pass Sunday, an NFL single-season record. He had only one interception and a record 134.1 passer rating. The old TD record was 15 by Eli Manning in 2011. The previous best rating was 130.3 by Steve Young in 1994. He also had a career-low rating in the first quarter this season at 74.5. Wilson is not only the first Seattle quarterback to lead the NFL in scoring throws – he tied a career high with 34 – but only the sixth to do so on a non-playoff team. Tyler Lockett’s 99-yard kickoff return TD in the first quarter Sunday was the second of his career (also Sept. 27, 2015 vs. Chicago). The only Seahawk with more than two career KOR TDs was Leon Washington, who had four between 2010-12, including a pair (101 and 99 yards) against the Chargers Sept. 26, 2010. Having gone without a playoff appearance since 1999, Buffalo owned the longest active postseason drought 17 years, in the big four of American sports leagues – NFL, NBA, NHL, MLB. But with the Bills qualifying for the playoffs Sunday, the Mariners move to the top of that list, having missed the postseason in each of their last 16 seasons. The Cleveland Browns own the next longest drought in the NFL at 15 years. The NBA’s longest belongs to the Minnesota Timberwolves at 13 years while the Carolina Hurricanes, at eight seasons, have the longest arid spell in the NHL. Why wasn’t J.D. McKissic used more? He’s not a between-the-tackles runner. McKissic’s body and speed are best suited for the perimeter on third downs. But it’s hard to do much of anything when it’s third and 11 half the time.